here they are, my four go-to white paints choices; used in my home and in some of my designs. all whites are not truly white, you know this if you have ever painted a room white. it looks white in the can, or on the swatch, but once you get it on the walls it suddenly takes on subtle, yet recognizable under tones. let's start with white dove, a white with a hint of grey, it's a neutral and is great to use in spaces you desire to have a warm white but without yellow undertones or without it looking like cream. white dove is great to use for trim work and kitchen cabinets, especially if you have another warm shade next to it. i've also used it a an all-over room color for a baby nursery when i wanted just a hint of grey to the white walls; and i used it on the trim and the walls for a more modern look. this room is painted in benjamin moore's natural cream, with white dove on the trim. chantilly lace, ah, how i love this paint! i painted my condo in this white (except for my master bedroom). it's what i call a museum white, a pure, clean and crisp white if you will without too much blue in it. while cool, it doesn't feel or look cold if that makes any sense. it really makes art and anything on the walls pop and stand out. a grand entry in benjamin moore's chantilly lace. cloud white is another one of my true loves. this white has just the right amount of warmth, with subtle yellow undertones, but they're so subtle the eye hardly notices as you take in the comfort and visual beauty this color brings. i've used it my master bedroom, and would recommend this paint for any room, not so much for trim though. it's the perfect warm white. cloud white on the walls, with chantilly lace paint on the trim. you can see how bright and white chantilly lace is compared to cloud white. another great white, benjamin moore's china white, has a bit of greige undertones to it but holds up as a true white when applied. it has less of the cool/blue feel to it than chantilly lace, less grey than white dove (and less warmth), and definitely a lot less warmth than cloud white. i would use this for walls or trim when a bright white is desired. 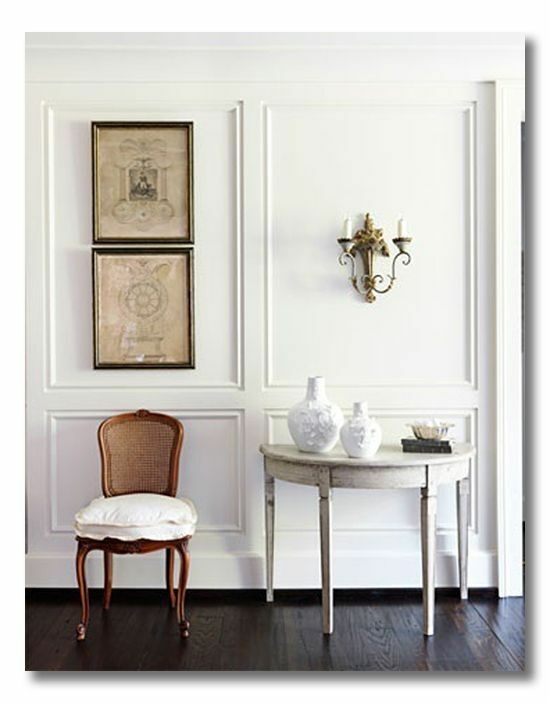 benjamin moore's china white shown here, looks great with dark wood floors, on trim or on walls.